If there was ever a reminder needed of Juliette Binoche's great and enduring talent, Assayas delivers it here. Olivier Assayas signe l'un de ses meilleurs films avec cette réflexion sur l'art du comédien, portée par une sublime Juliette Binoche. Un magnifique sujet, une écriture élégante, passionnante et sensible et une mise en scène fulgurante. Assayas atteint ici un apogée. 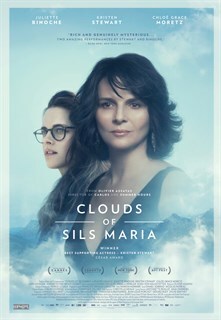 Olivier Assayas' drama The Clouds of Sils Maria stars Juliette Binoche as Maria, a celebrated actress who is traveling with her personal assistant Valentine (Kristen Stewart) to accept a lifetime achievement award for the playwright and director who launched her career. On the way, they learn that the celebrated artist has passed away. At the gala, a talented young director offers Maria the chance to star in a revival of the play that made her famous, this time portraying the part of the older woman that the young woman in the play seduces and destroys. Maria tentatively accepts, and as she attempts to find her way into the other character, she learns more about her new young co-star Jo-Ann (Chloe Grace Moretz), a talented but troubled teen the tabloids have made a fixture for her tantrums and bad behavior. Juliette Binoche in Clouds of Sils Maria. Courtesy of IFC Films. Juliette Binoche and Lars Eidinger in Clouds of Sils Maria. Courtesy of IFC Films. Kristen Stewart in Clouds of Sils Maria. Courtesy of IFC Films. Juliette Binoche and Kristen Stewart, in Clouds of Sils Maria. Courtesy of IFC Films. Chloë Grace Moretz in Clouds of Sils Maria. Courtesy of IFC Films. Juliette Binoche and Kristen Stewart Clouds of Sils Maria. Courtesy of IFC Films.